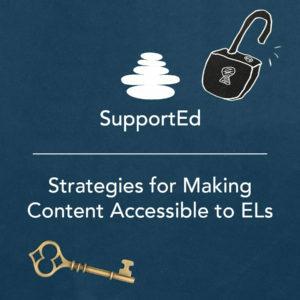 Are you an ESOL teacher who wants additional strategies to strengthen your work with ELs? Or, are you a content area or classroom teacher who needs strategies and tools to foster ELs’ acquisition of language and content? Or, do you know a colleague whose ELs could benefit from additional strategies? Use formative assessments to assess ELs’ language and content learning and plan instruction tailored to meet ELs’ specific academic needs. As in our other online courses, the heart of this course is a facilitated Professional Learning Community (PLC)-based discussion. You will be able to share your expertise with colleagues as well as learn what strategies others are using to effectively support ELs in their schools and districts.